I had a hankering for a genuine ‘Bertos-Style’ Burrito and decided this time, it had to be Humbertos in Gila Bend. Period. So to justify the journey, we planned a trip to Organ Pipe National Monument on the Arizona, Mexico border and on the way back up to Phoenix, we could detour along highway 86 through the Tohono O’odham Indian Reservation and make a quick tour of Kitt Peak on our way back. So we beefed up our security team of Sgt Gremlin (a Munsterlander mix), Corporal Dali (a Cheweeny) with Buck Private Flynn (a Labradoodle). 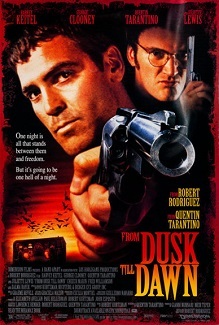 Their orders were clear and unequivocal – if you see or smell bank-robber vampires; or even just regular vampires that according to this movie absolutely infest the border – bark at them! Result: Fair amount of barking, but no vampires were sighted! And we made it to Kitt Peak – but first, the trip. Caution! Due to the scenic and spectacular visual nature of the trip, there are many, many explicit photos – it’s a photo-heavy blog. Sparkling wit and delightful prose will be kept to a strict minimum! In structuring a car trip to Gila Bend from Phoenix, one has to consider from what end to enter Gila Bend – Maricopa or the back way down Old Highway 80. It’s a worthwhile stop, and I hadn’t crossed the Gillespie Dam Bridge from the north. So it was settled: Gila Bend via Old Highway 80. The hottie on the Ducati was part of an entourage of folks, I think Italian, doing some kind of filming stuff maybe some sort of add for Ducati motorcycle or something. The guy riding the bike was an oldster – hip, but old. Made me feel kind of good that maybe when I’m even older, I can get a gig riding around the desert being filmed by three beautiful women. And headed out for the Mount Ajo driving tour – a 19 mile drive into the scenic Ajo mountains all on dirt roads! It would have been nice to hike up to the Arch – but it was already getting late and the sun was down by the time we got back to the campsite. Next time. We had a wonderful BBQed steak dinner and spent the rest of the night drilling the security team on escape and evasion. Up. Down. Tent. Truck. Bathroom. Down. Up. Corporal Dali did some valuable evasion training learning how to unzip the tent from the inside with her nose, where she and Flynn then bolted off into the night with Sgt Gremlin in hot pursuit. At about 0200 hours. A false alarm was set off in the truck sometime during the night, and I’m sure it was part of the training plan although I admit I had dozed off during the exercise. Thankfully, it immediately snapped me back to my senses. The security team responded appropriately, barking and running amok. It’s times like this that you can see the benefits of all the training and discipline that goes into a trip like this that really makes the trip, a trip like this. We packed it up and headed for Kitt Peak via the lovely and interesting town of Why, Arizona. From Why, we departed from Highway 85 and took Highway 86 east across the reservation. Soon, we could see Kitt Peak in the distance! Radio telescopes rock! And we were right next to this thing and they were exercising the axes so it was moving around and positioning itself. I just thought it was amazing and spectacular. After Kitt Peak, it was a blitz back home for work and business obligations – but it was a great trip! Hope you liked it! This was awesome on every level. Awesome descriptions, photos, everything. You teally captured the essence of the whole place and we really enjoyed this blog post. Those Olsens who own that store are no doubt descended from the large number of Mormon immigrants that came to Southern AZ in the mid to late 1800s straight from Scandinavia. There were recruiters who went by boat regularly to recruit people from the UK and Scandinavia to move straight to AZ and Utah. They sailed into Galveston and New Orleans and then took the Mormon trail across Texas to Utah and AZ. There they were joined by the founding Mormons of the Midwest and Texas, who refused to fight in the Civil War, opposing slavery, and being themselves persecuted. This was Indian terropitory and having multiple wives came in handy not only to deal with all the rough conditions and chores, but to maintain critical mass due to these harsh elements. It is conjectured that without plural wives they would not have succeeded in establishing their towns and would have failed to thrive altogether. Thanks for stopping by leocassetti! Interesting history in-fill too…a couple of things one notices while out in the desert and its communities; one is the history. There are a lot of unique stories surrounding these remote, rough areas, and the stories are little told for the most part. And I found that interesting about the Scandinavian Mormons. I hadn’t known, and I doubt that nowadays few people know, that a number of Scandinavians had converted to Mormonism in the 19th century in their home countries, and then emigrated to here after conversion! So that well-placed grocery store very well could have been founded by descendants of those immigrants. Another thing about the desert expanses you notice, from inside the air-conditioned SUV you are riding in while sipping a cool beverage, is just how rough and inhospitable the area is. One had to be pretty tough to survive out there! Very evocative, humorous and entertaining description of the trip– needs more dog photos!! !